India's automotive and computer industries have achieved remarkable synergy in the Reva NXG. Apart from looking good, this little car is Linux equipped and Internet enabled, in a much cleverer way than European or US cars. REVA Electric Car Company Private Ltd. (RECC), based in Bangalore, India, was established in 1994 as a joint venture between the Maini Group India and AEV LLC, California USA, to manufacture environment-friendly and cost-effective electric vehicles. Seven years of R&D earned the RECC recognition in the form of 10 patents and a globally accepted product. REVA, India's first zero polluting Electric Vehicle for city mobility, was commercialized in June 2001. The REVA Electric Car Company Pvt. Ltd. is located at the Bommasandra Industrial Area in Bangalore, India. The company has an installed capacity of 6000 units and 180 employees. The Production Center is based on an advanced flexible assembly line that ensures high productivity at lower break-even volumes. The success of commercializing REVA at affordable prices stems from the support it has received from The Maini Group. The Group has been committed to producing zero-pollution transportation equipment and automotive components since 1984. The Group produces battery operated materials handling equipment in manufacturing and is working on creating four, six and eight-seater vehicles under the brand name "Feri." ECC is guided by the "zero principle" of the Maini Group. Zero defects, zero time delays, zero inefficiencies and zero pollution. This is achieved through Zero Wastage and Zero Compromises. India's first electric vehicle REVA was launched by (Late) Shri Krishan Kant, the former Vice-President of India on May 11, 2001, after seven years of R&D and hailed as the most innovative and high technology product of the year. Over 1000 parts were designed using Pro/Engineer and the entire development was digitally executed in-house. Computer simulations and finite-element-analysis were carried out and tooling was done locally, making the car 95% indigenous at the start of commercialization. Thereafter, REVA was tested extensively at the Automotive Research Association (ARAI) for homologation and was certified for roadworthiness. The vehicle further underwent shaker, life cycle and home-charging tests along with successful testing in harsh road and environment conditions prevalent in India. Based on these tests, REVA's design was improved for aesthetics, comfort and safety. RECC received ISO 9001:2000 Certification by the Det Norske Veritas (DNV) in August 2002. With dwindling oil resources and a world characterized by smog, noise and pollution, governments and communities are becoming more aware of the need to develop a suitable, cost effective, clean urban transportation alternative. REVA's current models offer a top speed of 65 kmph and a range of 80 Km, thus ideally suited for today's city mobility. REVA has been uniquely developed to use a lightweight tubular steel space frame that supports all the suspension and body components. The body is made out of lightweight dent-proof ABS plastic panels. The extruded sheets are thermoformed to the desired shape and have a high impact resistance. The large doors are provided with side impact beams for further safety to passengers against side impact. The absence of an engine and other mechanical parts in front facilitate a large crush zone in case of a frontal collision. The spare tyre, designed to be in the front, further helps in reducing impact. The battery pack position is so designed as to keep the center of gravity low to add further safety to the vehicle. Dual-hydraulic and regenerative braking are added for additional safety. Two on-board computers are provided for Energy Management and Data Acquisition for quick diagnostics. The Energy Management System (EMS) extends range by 15 % and battery life by 25%. RECC incorporates the latest in EV technology and cost effective manufacturing processes making REVA commercially viable at an offer price significantly less than that of EVs globally. REVA is easy to drive and most ideal for "stop-start" traffic conditions without a clutch and gear. It has a small turning radius making it easy to maneuver and park. Being an electric vehicle, the REVA has low vibrations and noise leading to minimum driving fatigue. REVA has an onboard charger to facilitate easy charging that can be carried out by plugging into any 15 Amp socket at home or at work. An intelligent 'low battery' warning light and a fuel gauge that allows easy estimation of driving range ensure that the driver is not stranded. Customers can customize the design of their car by choosing from 2000 shades. Body coloured bumpers and mirrors enhance its value. Ever since REVA's conception, REVA Electric Car Company (RECC) has gone a step forward by developing India's first prototype of a fuel cell powered car, a technology hitherto attempted only by a few auto giants worldwide. REVA's fuel cell prototype was unveiled by the President of India on Technology Day, the 30th of June, 2004, in New Delhi. Chetan Maini is the Deputy Chairman of REVA Electric Car Company Private Ltd. (RECC), a joint venture between Maini Group of Bangalore and AEV LLC, USA. Chetan has over 14 years experience with electric vehicles during the course of which he has developed over six electric, solar and hybrid-electric vehicles in India and the United States. Prior to taking over as the Managing Director of REVA Electric Car Company, Chetan worked for five years in the USA with General Motors and Amerigon Inc. As Program Manager with Amerigon Inc, Chetan was responsible for all electric vehicle programs and in fact initiated the REVA Project while he was there. Chetan holds a graduate degree in Mechanical Engineering (BSME) from the University of Michigan where he focused on solar electric vehicles, and a postgraduate degree in Mechanical Engineering from the University of Stanford where his focus was on hybrid electric vehicles. Chetan was the team leader of the Solar Car team that won the GM Sun Race and stood 3rd in the World Solar Challenges in Australia. He also headed the hybrid electric car project at the University of Stanford. Chetan has a patent in energy management system for Electric Vehicles and has presented several technical papers on EV's globally. Chetan has received the Dr. M.S. Swaminathan Award for Environment Protection for the year 2001, The YEO Thomas Alva Edison Award for Entrepreneurship and Innovation in February 2002 and the SESI Business Leadership Award in 2004. Electric vehicles (EV's) are gaining popularity in international markets as countries are becoming more environmentally conscious. Besides being a zero-polluter, REVA has a competitive advantage over other global EV manufacturers because it offers the state-of-the-art EV technology priced significantly lower than other EV's in the market. India has the maximum manufacturing potential of EV's for the following reasons: significant auto component infrastructure, low manufacturing and R&D costs, mechanical hardware availability, highly qualified engineers and aerospace and automotive technologies. RECC has currently over 1000 vehicles on the road in India as well as UK, Malta, Japan, Romania, Switzerland, Norway, and Ireland. REVA Electric Car Company Pvt. Ltd. (RECC) announced trial exports of the REVA in 2002 and received positive feedback from UK, Malta and Japan. The company began the process of EEC certification for homologation of electric vehicles with the intention of commercially selling in the European Union and accelerating entry to global markets. REVA received the EEC (European Economic Community) Certificate as a Quadricycle for its electric vehicles in December 2003, paving the way for an aggressive foray into the European Union. 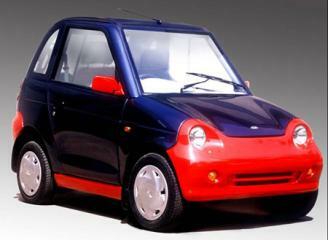 The certification marked the commercial entry of REVA, re-christened G- WIZ into UK with an order for 500 cars. Sales have also commenced in Malta and Japan due to the encouraging support from the government. In addition, the REVA is being test marketed in USA, Sri Lanka, Norway, Ireland, Romania and Cyprus. U.K. - G-Wiz is exempt from paying parking fees and congestion taxes (5 pounds). Other benefits include sales and road tax exemptions, waiver of parking fees, special subsidies and exemptions and 100% depreciation in the first year itself in many parts of Europe. The G-Wiz has been rated as the most energy efficient vehicle in the UK by the Energy Saving Trust. Japan - In Japan, the government has announced a US$ 2,600 subsidy for the end user for buying a REVA. U.S. - The Government gives up to US$ 4,000 to each buyer of an EV. A fixed percentage of all governmental vehicles to be EVs in California; preferential parking areas earmarked, subsidy on the installation of charging infrastructure and incentives by power supply utilities provided. France - The Government gives 5,000 FF to each buyer of an EV; low road taxes are applicable; 100% depreciation for corporate clients available; 20% of all public transport has to be electric; EVs have free parking; EVs are encouraged to be used as rental cars in public; no taxes are imposed on electricity used for charging EVs. Copyright © Tom Worthington 2006.